T cells protect the body from foreign substances (known as antigens) and are an essential component of the body's immune system. New immunotherapies that use a patient's own T cells to treat disease have already proven strikingly effective in treating some cancers, and cancer researchers around the world are racing to improve these treatments and apply them more broadly. The engagement between T cells and antigens sets off the immune response, with cascade of signals within the T cell. The process involves an intricate choreography of receptor proteins and their ligands at or near the surface of the T cell and the antigen-presenting cell (APC). A team of researchers, led by Columbia Engineering Applied Physicist Shalom J. Wind and Oxford University and NYU-Langone Medical Center biologist Michael L. Dustin, has revealed the geometric underpinnings of T-cell triggering through the precise engineering of T-cell receptor geometry in all three dimensions. They used nanofabrication to create a biomimetic surface that simulates the key features of the APC. This surface presents T-cell receptor ligands (molecules that bind to and stimulate receptors on the surface of the T cell) in a variety of different geometric arrangements, with different inter-ligand spacings arranged in clusters of varying size. The findings are published online today in Nature Nanotechnology. "Our results could have a significant impact on the field of adoptive immunotherapy, which has been seeing remarkable success recently in treating certain cancers," says Wind. "Our nanoengineering approach has allowed us to investigate the role that geometry plays in T-cell triggering with unprecedented precision and control. 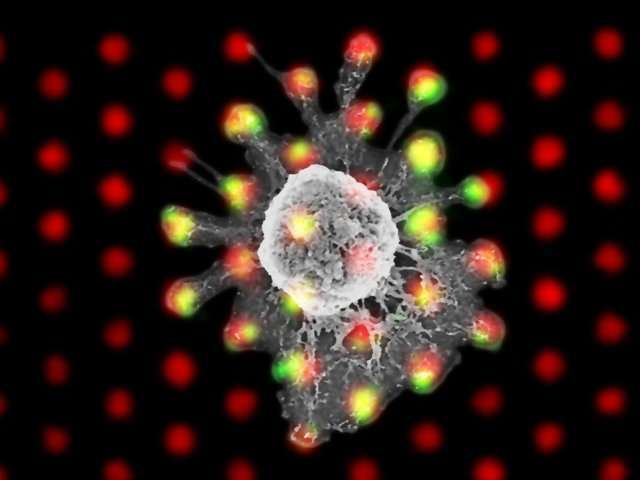 We became very interested in determining how important the geometric arrangement of molecules is to the early steps in T-cell stimulation, because this could provide new insight into this process and might even offer a new way to control T-cell activation." 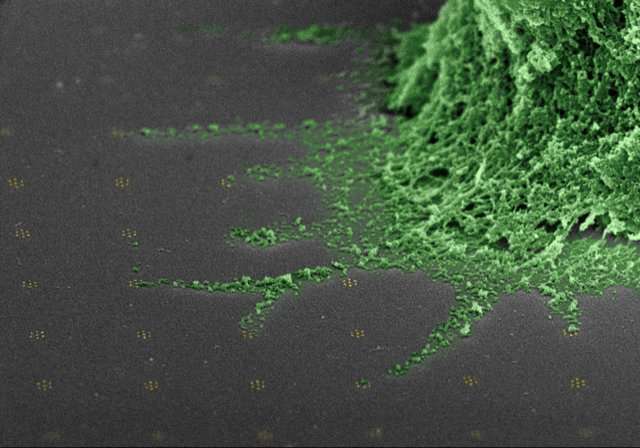 The new advance in the team's nanofabricated biomimetic surfaces, which was key to the study published today, was the development of a way to place the ligands on "nanopedestals" on the surface, effectively controlling the distance between the T cell and the APC, while at the same time controlling the spacing between the individual ligands. They also devised a technique to introduce other molecules that play an important role in the T-cell/APC engagement and allowed them to bind to one another. The combination of these innovations?the precise geometric control of ligand position together with placing the ligands on the nanopedestals and enabling the additional molecules to play their usual role?led to a striking discovery: a sharp increase in T cell triggering when the ligand spacing fell below 50 nm. But this threshold appeared only when the T cell was separated from the surface (or APC surface) by about 23 nm, using the nanopedestals. The researchers showed that this was a result stemming from the spatial aspects of CD45, a protein whose physiological role is to inhibit T-cell receptor activation. If the T cell and the APC are very close together, then CD45, which is a "big" molecule, is "squeezed out" of the area, allowing T-cell receptor activation to proceed. With some additional room between the cells, CD45 can prevent this?unless the T-cell receptor ligands are too close to one another (less than 50 nm), in which case, the lateral spacing partially squeezes out the CD45. The role of CD45 exclusion from the T-cell receptor has been a hot topic among immunology researchers: some think it is an absolute requirement for receptor triggering, while others say that it plays only a partial role. "In our study, we were able not only to observe a spatial threshold that shows that CD45 exclusion is important, but also to see that triggering can take place even when CD45 is not entirely segregated from the T-cell receptor region, as long as the spacing is small," says Dustin, who is a Professor at the Kennedy Institute of Rheumatology. "Not only does this shed important light on the question of CD45 exclusion, but it suggests a functional role for T-cell receptor packing at close dimensions." This highly interdisciplinary project combined semiconductor device processing with cellular biology, surface chemistry, and biochemistry. The Columbia team, which included Michael Sheetz, which included Michael Sheetz, Emeritus Professor of Biological Sciences and Biomedical Engineering and Director of the Mechanobiology Institute of Singapore, combined their expertise, taking the tools and techniques originally developed by the semiconductor industry to fabricate transistors and adapting them to address important questions in cell biology. The team has been collaborating on cellular geometry sensing for almost 15 years. They use lithographic patterning, thin film deposition, and etching to create "chips" that are built on microscope slides, rather than silicon wafers. Using the facilities available as part of the Columbia Nano Initiative, they have been able to create arbitrary patterns of individual proteins (far smaller than even the most advanced transistor elements), with precise control over the location of each and every protein. Dustin noted, "This was a great collaboration, as biologists have struggled with ways to precisely control the space between cells. The Columbia engineers developed a method to effectively 'jack up' the live T cell by 10 nm over a biomimetic surface developed by the NYU/Oxford team. These elements came together to address a fundamental question of relevance to immunotherapy." The results reported today may have important applications in adoptive immunotherapy and possibly beyond. With the specific knowledge of the geometric parameters underlying T-cell receptor triggering, researchers could improve some therapies by, for example, designing new chimeric antigen receptors (that are the basis for CAR T-cell therapy) with specific geometric features that optimize therapeutic outcomes. Nanofabricated surfaces like the ones used in this work might also be used to improve both T-cell expansion and activation outside the body, possibly increasing the efficiency of this type of immunotherapy and shortening the treatment time. "This work is really clever," says Carl S. June, a professor of immunotherapy at the Perelman School of Medicine, University of Pennsylvania, and a pioneer of adoptive T-cell transfer therapy, who was not involved with the study. "The direct evidence for a non-linear role played in and out of the plane of the membrane in TCR (T-cell receptor) triggering is quite novel and has implications on the design of CAR T cells. This approach might guide the development of CARs that would have better discrimination between tumor cells and normal cells that have lower densities of target." Sheetz adds, "This technology can have a much larger role in addressing the general issue of how the spacing between cells as well as between cells and substrates can affect signaling processes." "Beyond our focus on immunotherapy," Wind notes, "this work shows how the power of transistor fabrication technology can be applied to problems in biomedicine. Following this path promises to lead to more exciting developments in the future."